No matter how old you are, a must do for every Disney World trip is to stay late in the park and check out the fireworks. It’s something I’ve been doing with my parents since I started visiting Disney World as a child, and the tradition still stands almost three decades later. Fortunately, Disney’s fireworks and nighttime spectaculars have only increased in number and improved in quality since I had to sit on my dad’s shoulders to be able to see the show. Which of the nighttime shows is most worth the wait? Read on to find out! Disney’s Hollywood Studios’ seasonal fireworks for the holidays features a montage of clips from The Nightmare Before Christmas, Prep & Landing, Mickey’s Christmas Carol, and Beauty and the Beast. The show combines pyrotechnics, projections, and lasers. The overall show is cute and fun, but it really pales in comparison in the “spectacular” department. It lacks the wow factor that the other fireworks shows in this list have. Maybe it will be retooled when it returns this November, but for now, it lands firmly at the back of the pack. Showing Mickey Mouse’s journey into imagination, Fantasmic is a really fun show. It’s chock full of a wide cast of Disney characters, and it features an awesome soundtrack and some great special effects. Then why is it second to last on this list? Because, especially after the newly unveiled Fantasmic 2.0, Disney World’s version pales in comparison to the original Disneyland Fantasmic. 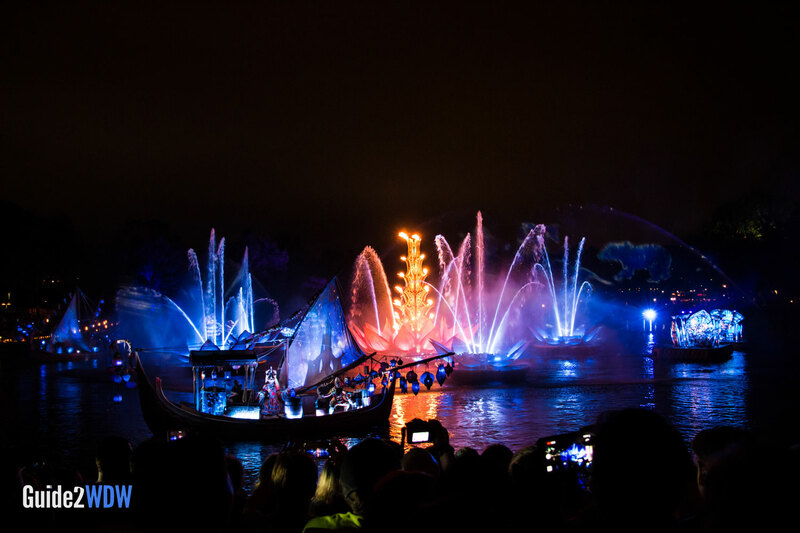 Part of this is Disney’s choice to stage Fantasmic in a stadium, which removes much of the intimacy and impact of Disneyland’s version which is on the Rivers of America (which sits much closer to the audience). 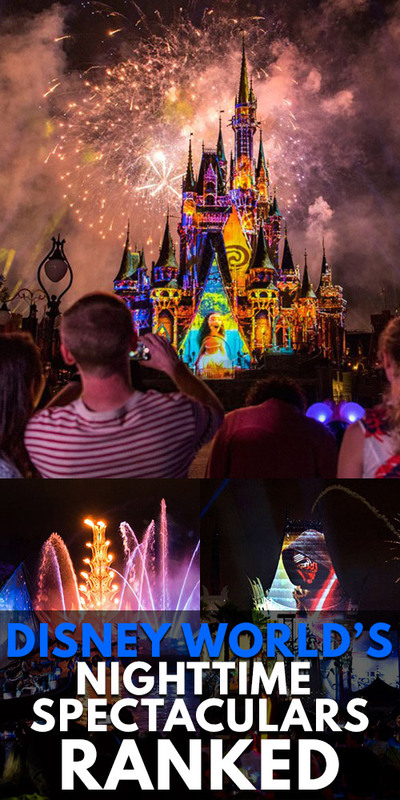 The Disneyland version has also received multiple updates throughout the years which has drastically improved the special effects, while Disney World’s version has stayed stagnant. 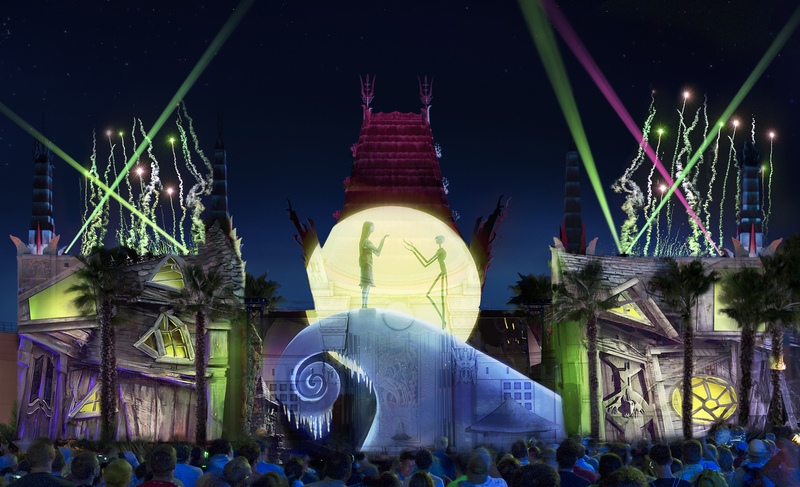 With some investment, Disney could bring Fantasmic back up to speed. Rivers of Light features some of the most beautiful imagery and mesmerizing sights that you can see anywhere at Disney World. It’s basically a more zen version of World of Color. The live music, fountains, and fire make for a good show celebrating nature and life. It’s also the least exciting of any of Disney World’s nighttime spectaculars. Rivers of Light is meditative, which might not be for everyone, especially young kids who might find it boring. I enjoy Rivers of Light, but your mileage may vary. Before you start commenting “IllumiNations is my favorite! Why isn’t this higher on the list?” Let me say this: IllumiNations is amazing. It’s one of my favorite fireworks shows ever. It has so many things going for it: amazing pyrotechnics, great viewing all across the lagoon, newly-added lasers, a great message of world peace, and the music! The score is one of those tracks that I’ll put on from time to time if I want to get in a better mood, and it never fails. 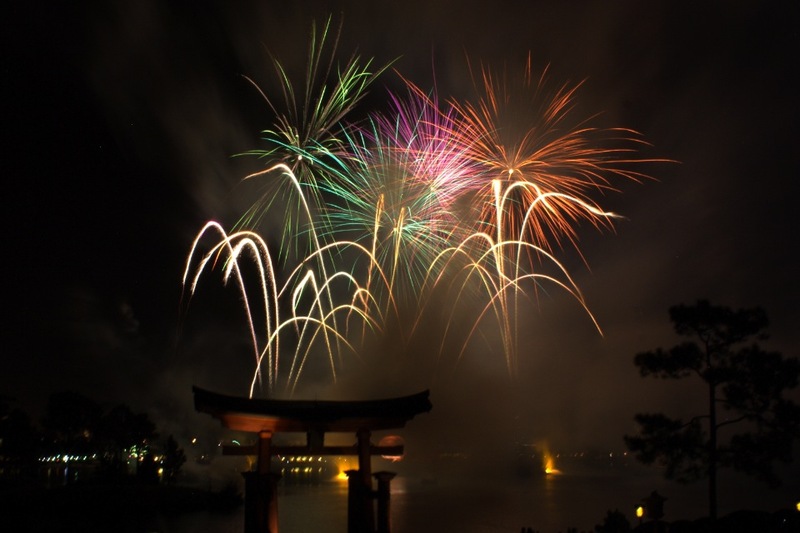 IllumiNations is a must do any time I go to Disney World. So, why is it fourth on the list? First of all, I think there’s a pretty big jump from number 5 to number 4 on this list, as the top four are so close in quality. It’s little things that separate these, like the fact that IllumiNations does drag a bit in the middle. The screens on the globe have improved in recent years, but they’re still hard to see. First of all, let me say this: If you are not a Star Wars fan, this would go to number 4 on the list, behind IllumiNations. However, since I am a Star Wars fanatic, these fireworks are pretty close to the greatest thing ever. 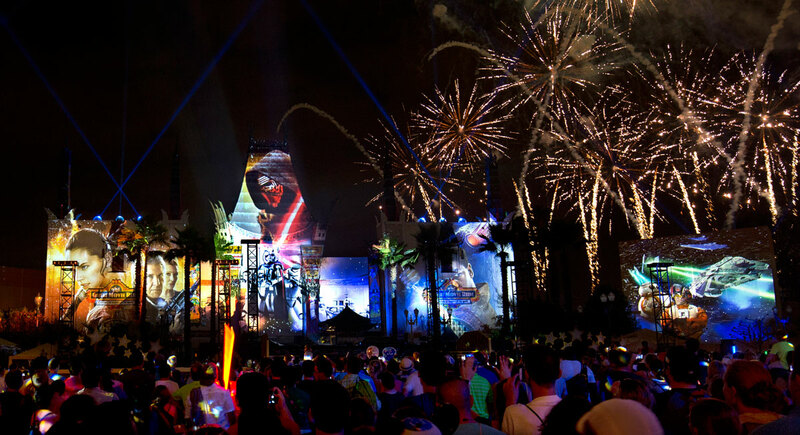 Sure, Star Wars: A Galactic Spectacular features fireworks, lasers, and projections, like other entries on this list. But the show is more than the sum of its parts, with special effects greatly enhancing what is being projected. This show has so many highlights: John Williams’ score, lasers shooting over your head as you see X-Wings and Tie Fighters fly around on screen, or the finale with a giant Lightsaber spotlight into the sky. I have goosebumps pretty much the entire time while watching this show. Of course, Disney’s greatest fireworks are reserved for their ticketed holiday parties. HalloWishes and Holiday Wishes feature the most stunning fireworks array out of any of Disney’s nighttime spectacular. While the shows have limited projection (not nearly to the level of Happily Ever After or Star Wars), they make up for it with amazing seasonal soundtracks and melt your face (but fortunately not literally) fireworks. The best part are the finales, where fireworks go off all around the Seven Seas Lagoon. While I prefer the soundtrack of the HalloWishes and the fireworks of the Holiday Wishes, these shows are so close in quality that they’re basically a tie in my book. 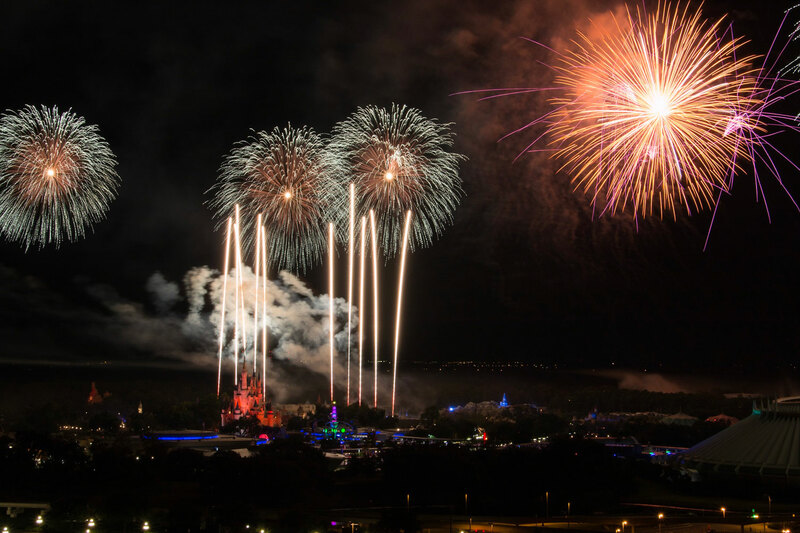 If you’re visiting Disney World between September and December, these fireworks shows are one of the biggest reasons to consider going to either Mickey’s Not So Scary Halloween Party or Mickey’s Very Merry Christmas Party. But if you decide that you don’t want to pony up for an extra ticket, there are ways to see these holiday fireworks for free. 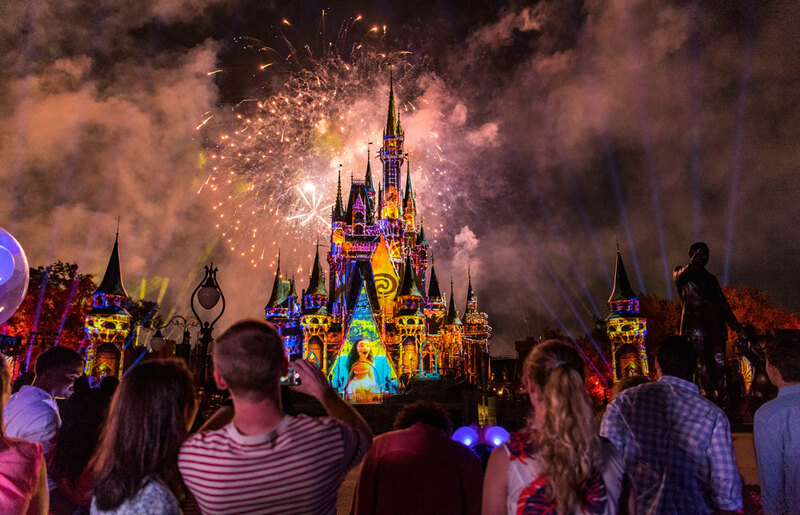 These are detailed in my Best Free Things at Disney World article, as well as my guide on the best places to watch Magic Kingdom’s fireworks outside of Main Street. That’s a finale on my list of finales. What would your ranking be? Which is your favorite? Let me know in the comments below?